Deep sea sharks live so far down in the ocean they're hard to observe. Over the last couple of decades, scientists have been able to access deep water to learn about these big, mysterious fish. Some of these sharks are odd-looking, others are tiny and others are among the largest in the world. 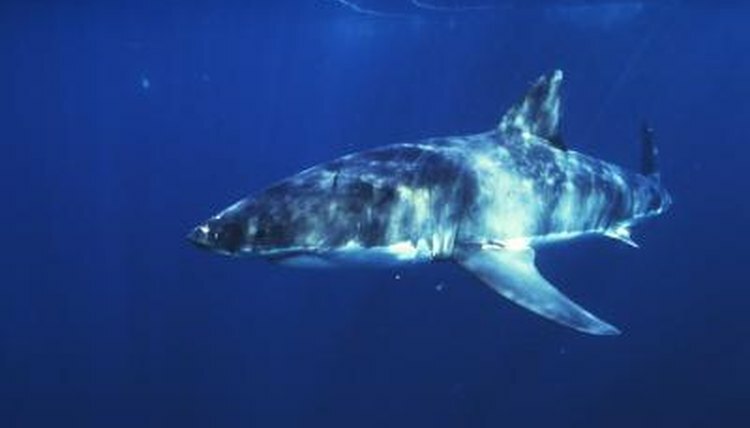 According to ocean conservation group Oceana, sharks living below 984 feet, or 300 meters, are considered deep sea sharks. Science is still learning about these mysterious creatures and according to Oceana, the limited information available suggests deep sea sharks are at risk of decline from fishing pressure. These fish have a lot of oil in their large livers to help regulate their buoyancy. They're vulnerable to deep-sea trawls, longlines and gillnets used by fishermen seeking squalene, an oily substance in the sharks' livers used in many cosmetics. The goblin shark has an appropriate name, given his frightening appearance. He's a strange-looking guy, sporting a protruding snout and vicious teeth. Reaching about 11 feet long and 350 pounds, he has a pink tint from the blood vessels showing beneath his semitransparent skin. Look for a goblin shark at depths of around 4,000 feet in seas around the world. The frill shark is also a strange-looking shark, able to live in waters as deep as 4,200 feet. If you see one of these guys in shallow water, he's likely in distress. He grows to 6 feet long and has a whopping 300 sharp teeth in 25 rows in his large mouth. His mouth can distend, allowing him to eat something more than half his body length, and he dines on other sea creatures residing at the same deep level he does. The bluntnose sixgill shark is more versatile than other deepwater sharks, able to exist in water as shallow as 3 feet or as deep as 8,000 feet. He's rarely found at depths shallower than 300 feet. During the day he tends to stay deep in the sea, sticking close to soft sediments or rocky reefs on the ocean's bottom. He'll rise toward the surface at night and can be found in shallower waters during warm months. This is a big shark, growing to 16 feet and 1,300 pounds. The Greenland shark is one of the largest sharks in the world, maxing out at 24 feet long. He lives in the cold, deep waters of the ocean, approaching the surface only if the temperature dips to about 33 degrees Fahrenheit. He can be found as far down as 7,000 feet in the very cold, deep waters of the North Atlantic and Arctic Oceans. At only 19 inches long, the cookiecutter shark doesn't seem like much of a threat, though that doesn't stop this guy from wounding larger fish and marine mammals. This little fish lives in deep water below 3,000 feet during the day, traveling up to about 1,000 feet at night. He dines on squid, small fish and crustaceans.